I haven’t always knitted voraciously like I have recently. I have periods of time when I don’t knit a ton, and periods when I do. For the past few years, I have knitted a little off and on but didn’t really keep up with trends or ravelry or anything. I knew that styles and patterns were evolving and changing, but didn’t really consider that maybe techniques were being developed as well. Imagine my surprise when, the other day, I discovered Tillybuddy’s very stretchy cast on for single or double rib. I was looking for directions for a good cast on for ribbing and just stumbled across it. I tried it, liked it, and proceeded to use it for several projects that all started in rib. Including my current WIP Not a Buff. 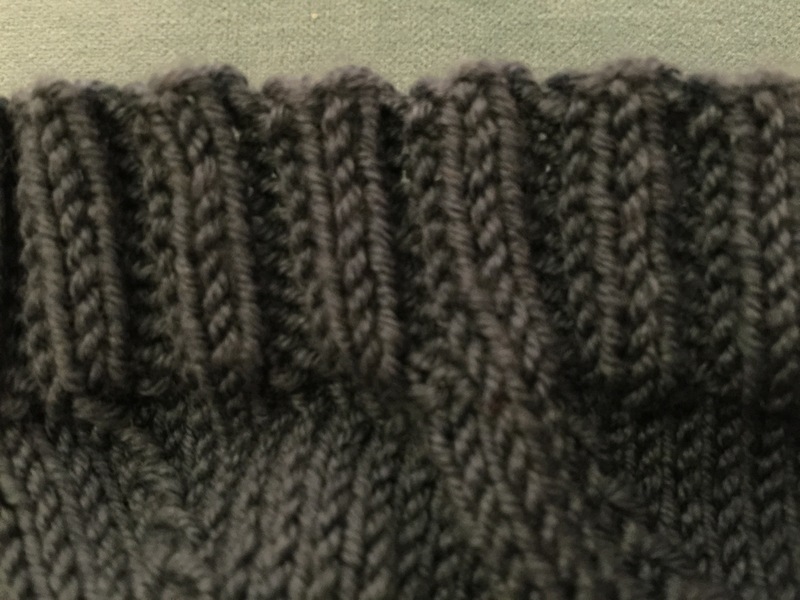 So, last night I knit the last of the pattern section and the final rows of ribbing. 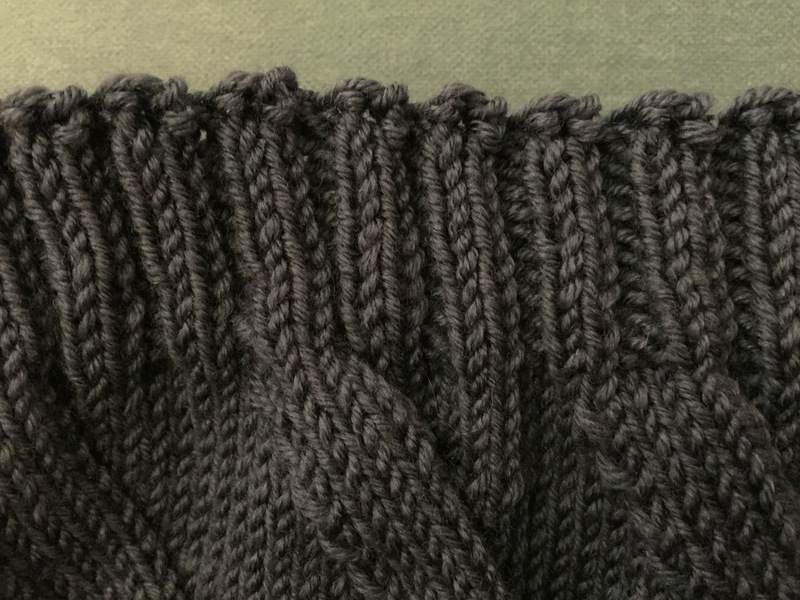 I thought about binding off in pattern, which is how I’ve typically treated rib in the past, and just balked. 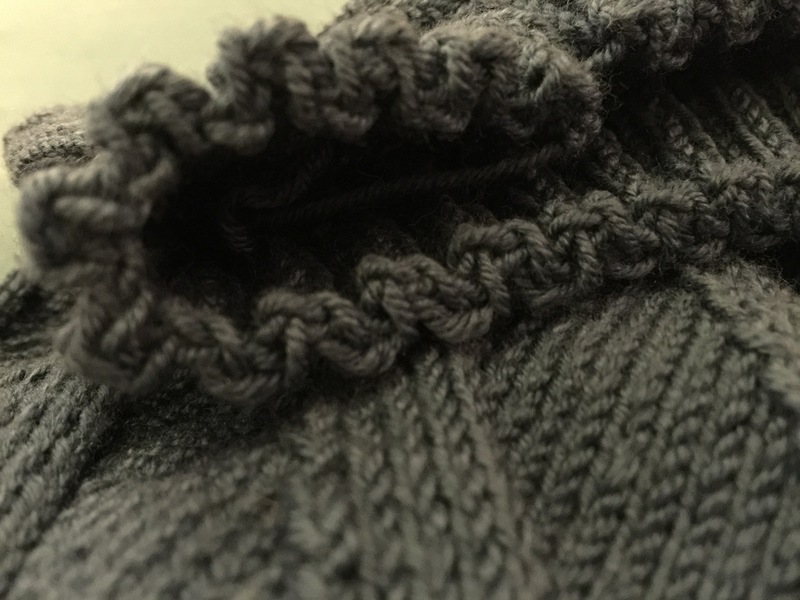 The cast on edge was so stretchy and soft, and it followed the wavy zig zag contour of the rib. It did not flare out, distort the shape of the ribs, pull or look too tight. It just stretched very satisfyingly and then returned to its soft accordion folds. I couldn’t bear the thought of the cast off edge not living up to the cast on edge’s standards! So back to the web I went. 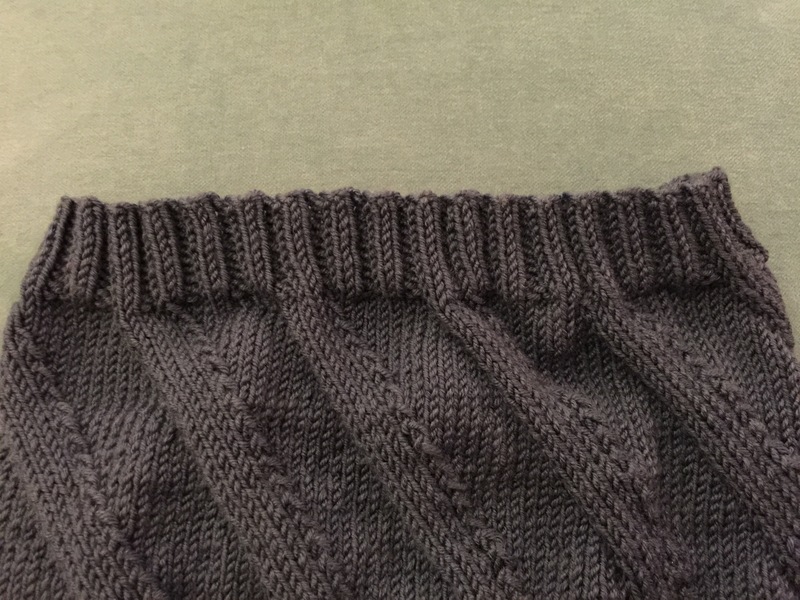 Well, I found Jeny’s Surprisingly Stretchy Bind Off, or JSSBO. I researched it along with a couple of other methods and decided it had the best chance of matching the cast on edge well. I stayed up way too late casting off all 140 stitches using it and I’m more than a little enamored. The two edges are very, very similar, to the point where it takes me a few moments to determine which is which. The only really good way to tell them apart is by looking for the twist at the top of each rib on the JSSBO. They both scrunch up and stretch back in the same squishy, gratifying way. 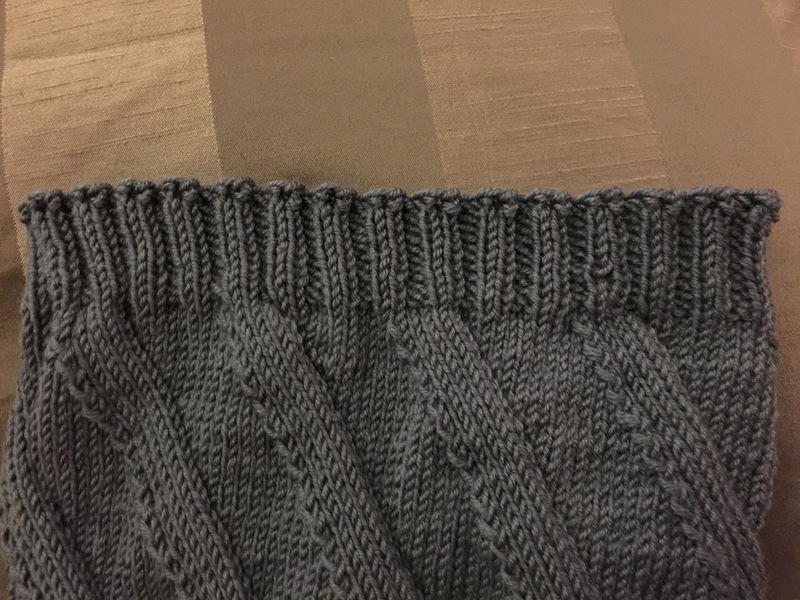 I might have spent several moments last night squeezing my knitting, and no, that’s not a euphemism for anything! All that is left to do for this piece is weave in the ends and then I think I will block it. 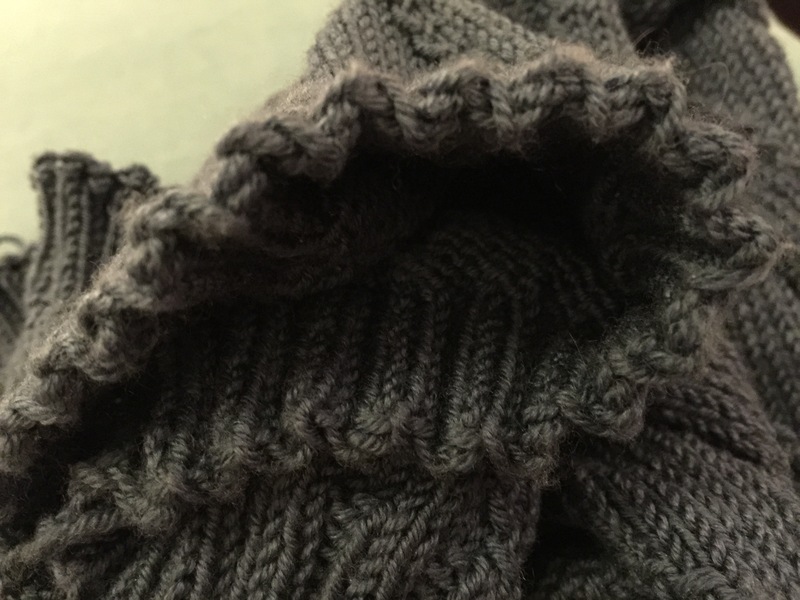 I know it doesn’t really require blocking, but since the yarn has a bit of a shine to it, it has very high stitch definition. That means that the line and shaping show off well, but it also means that any little errant twist is extra visible. So, I will block it just to smooth everything out and make it all look a little neater. In other finishing news, the wifey found my copy of The Knitter’s Book of Finishing Techniques by Nancie M. Wiseman! I don’t plan to stop searching out new techniques, but I am glad to have it on hand as a resource. One of these reversible cabled scarf patterns: Gwynedd, Palindrome, Rivulet or this one from Cables Untangled by Melissa Leapman. I’ve made the last one before a couple of times and really love it. I’m a little obsessed with Rivulet, though. I think that one might win. I haven’t selected a yarn to use yet. Lots to decide! I would like to fast forward through my two twelve hour shifts tomorrow and Wednesday and just commence with the knitting!